While winters bring us desis the joy of tea, nuts, cozy bed, and a cup of coffee after a relatively longer spell of Summer, but also some skin woes such as, dryness, itching and even eczema or psoriasis (in severe cases), which can be prevented only if we understand that our skin demands some extra attention (read: hydration) as a preventive measure. Recently, we were sent the samples of some skin care, hair care and bath and body products by Marjees, which also included the Honey & Shea Butter Soothing Hand & Foot Cream samples for us both. Read on to find out if it lived up to our expectations! 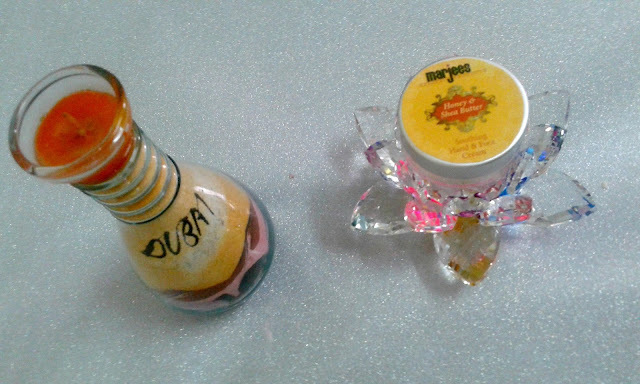 Based in Lahore, Marjees is a Pakistani natural skin and haircare brand. Headed by the super talented Maryam Waheed, it has been co-founded by the concerned parents of two sons, who felt the dire need of coming up with natural products devoid of parabens, sulphates, phthalates, and any other harmful additives and enriched with skin loving ingredients for their children. Sweet almond oil, olive oil, shea butter, emulsifying wax, stearic acid, distilled water, honey, fragrance oil, and preservative. 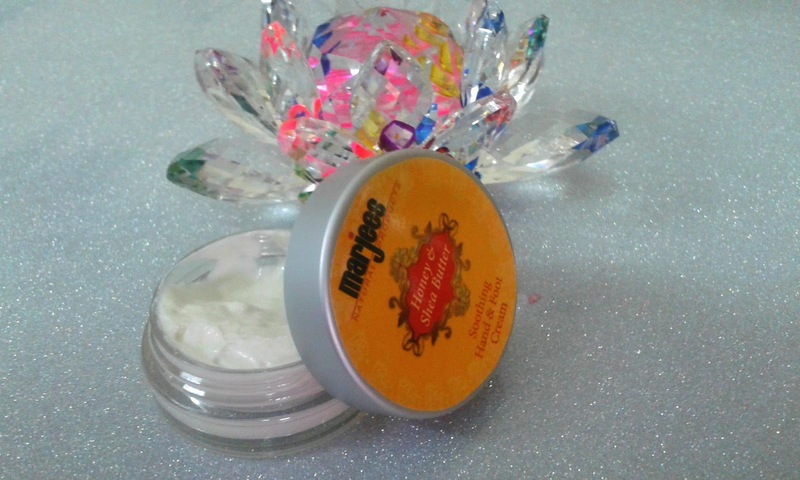 The Honey and Shea Butter Soothing Hand and Foot Cream by Marjees comes in a sturdy acrylic jar with a screw tight lid in a matte silver finish. One cannot just rave enough as to how classy is the packaging. Although the complete ingredients’ list is missing from the label, the name of the product clearly states two of the most active ingredients: Honey and Shea butter. As far as the fragrance of the cream is concerned, (which is by the way, something that we’re always tempted to check beside the list of ingredients) is just divine. It actually smells of pure honey, which is such a turn on in our case as it is the principle ingredient of the product, and one of our favourite natural skincare ingredients. Let's delve deep into the active ingredients of this hand and foot cream. Honey, a rich source of anti-oxidants, is known for its anti-aging, soothing, moisturizing anti-inflammatory and anti-bacterial properties. Shea butter, one of the most frequently used ingredient in handmade body butters and other deeply moisturizing lip, hand and foot products. It is an excellent source of Vitamin A, E and F, is highly moisturising and a natural source of SPF, which relieves sunburn. It also stimulates collagen production, heals chapping, chafing, and cracking of dry skin and is a natural treatment for psoriasis and eczema. Sweet almond and olive oils are also rich sources of Vitamin E which have anti-aging and moisturising capabilities. The white coloured Honey Shea Hand and Foot Cream is neither like a runny fluid nor too thick and greasy. It has a whipped cream-like consistency, which clearly means no tacky applications. It absorbs within seconds and does not make your skin feel clammy. Samra actually vouches for the fact that it is actually comparable to The Body Shop’s Africa Honey and Beeswax Hand and Foot Butter and Body butter Honey Hydrator. How cool is that? Yes, it is actually that good and does not even come with a hefty price tag. If applied on a regular basis, the Shea Hand and Foot Cream by Marjees keeps the nail cuticles soft and hydrated. No hangnails, ladies! Once applied, it keeps the hands and feet moisturized for a good number of hours. Slather it on your feet only once a day and you’re good to go. However, since we wash our hands more often, like every other hand cream, it would need to be applied more often. Overall, the Shea Hand and Foot Cream by Marjees is a winner and a must-have for the coming winter season. Irresistible fragrance of raw honey. Non greasy, whipped cream like texture. Enriched with the goodness of skin-loving almond and olive oils, honey and Shea butter. Moisturises the skin for a good number of hours. Does not cause any skin irritation. Long lasting if kept in an appropriate soap dish to prevent them from melting. The full sized Honey Shea Hand & Foot Cream by Marjees weighs 60 grams and it comes with a price tag of PKR 600/- and can be purchased online through the brand’s official facebook page HERE. The quickly absorbing, light-weight, non greasy yet effectively hydrating formula of the Honey Shea Hand Cream by Marjees makes it your perfect on-the-go moisturiser which would neither make your hands and feet feel sticky nor let your hand and foot accessories oxidize. Try it this winter and you won’t be disappointed. Have you tried any product by Marjees? We’d be delighted to see your feedback on the post below. Disclosure: The sample sized product featured in this post was sent to us as a PR sample for review purposes, however, the opinions expressed hereby are strictly unbiased, based on our personal experience with the product.